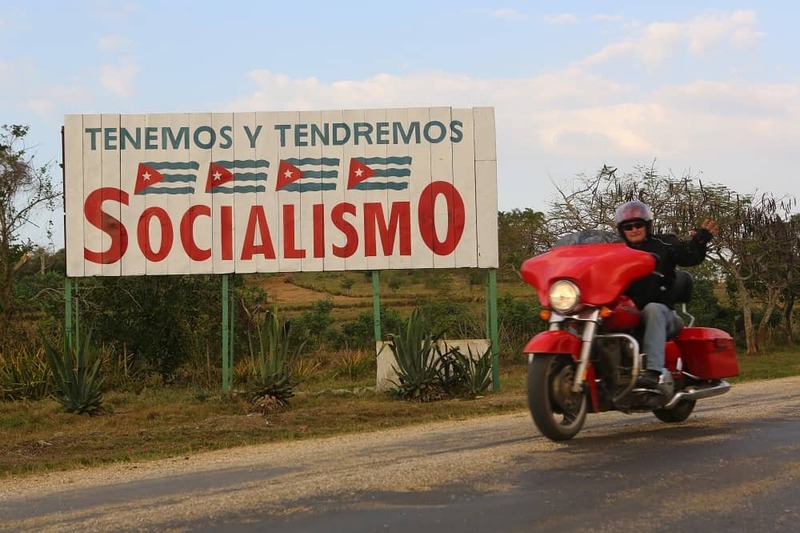 Eighteen years had passed since I first rode my R100GS to the Bay of Pigs during a three-month-long, 7,000-mile exploration of Cuba as a professional journalist. Eighteen years spent dreaming of leading the first U.S. group motorcycle tours of the island. Finally… I was so stoked, I couldn’t suppress my glee any longer. 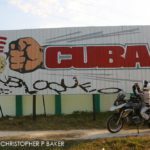 So that’s how I found myself with 14 other eager boomer motorcyclists flying south from Miami to participate in a 14-day all-Cuba program. 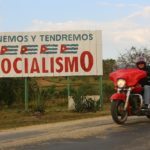 Our slice-of-life engagements with Cubans—from tobacco farmers to harlistas, owners of pre-revolutionary Harleys—would guaranteed a richly rewarding immersion with Cuba’s profound history and culture as we rode a 2,000-mile counter-clockwise circuit from Havana to Baracoa, at the eastern tip of the island. Arriving at Baracoa was its own adventure as we roared up La Farola, the steep mountain highway (completed since the Revolution) with nerve-wracking bends that switchback up and over the Sierra Cristal via the valley of the Río Yumurí. With its bridges cantilevered magically from the mountainside, La Farola struck me as a marvelous piece of engineering. Beyond the summit the world fell away as the road spiraled down to Baracoa, hovering on the distant horizon beneath a brooding twilit fusion of valley and molten sky. Cuba is the flattest isle of the Greater Antilles. Our route was mostly level; the roads well-paved. West from Baracoa, however, the shoreline highway whittled down to an unpaved scrambler trail—a real roller-coaster—pitted with potholes brimming with a bouillabaisse of blood-red mud accumulated after recent rains. This 40-km-long enduro section added a welcome and adventurous challenge sandwiched between two full weeks of non-technical riding. I rode the trail standing up as I hauled along in third gear. 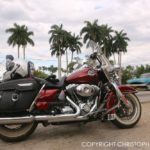 Our bikes—a combination of BMW F650s and F800s, plus four Harley-Davidsons—were supplied by Edelweiss Bike Travel, an Austrian company that organized our tour and has been offering two-wheel tours in Cuba to Europeans since 2012. The company also supplied a support van to carry our gear. Wherever we stopped, Cuban males coalesced to give us high fives and marvel at the exotic bikes. “Phew!… hombre!” they exclaimed. “What marque is this? How big is the engine?” And, inevitably, “How fast does it go?” You’d have thought we’d landed in flying saucers. Prior to the Revolution, Harleys were standard issue for Cuba’s police and the military. Then Cuba spun off into Soviet orbit. 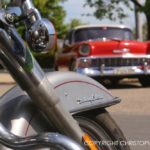 No more Harleys were imported, thanks to the U.S. embargo (Cubans call it el bloqueo, the blockade) that still hangs like an axe over Cuba. Thereafter, Soviet bloc Urals, MZs and Jawas flooded Cuba during four decades. Keeping them going is a testament to Cuban resourcefulness, ingenuity, and indefatigable optimism in the face of shortages and other difficulties we can barely imagine. The visitor’s first reaction is of being caught in a 1950s time warp. Cars from the Eisenhower era are everywhere: Chrome-laden DeSotos. Corpulent Buicks. Stylish Plymouth Furies. And other relics of Mafia-era ostentation putter along beside modern Japanese taxis, sober Russian-made Ladas, and dour 650cc Urals with sidecars. 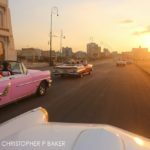 It was hard to stay focused on the road as we roared along Havana’s Malecón seafront boulevard. Luis Enrique rode lead. The Doobie Brothers’ ‘Taking it to the Streets’ surged from the speakers of his blood-red Street Glide as we hit the Autopista Nacional, Cuba’s only freeway, and cranked up to 120 kph, heading east. The concrete eight-laner runs through open countryside flat as a carpenter’s level. We had it virtually to ourselves save for the occasional yanqui jalopy, Soviet tractors, and creaky wooden carts pulled by oxen, dropping long stalks of cane as they went. I was thrilled to be back in the saddle, retracing my journey through a country I’ve grown to know well and love dearly. Enraptured, I cooked down the highway, the F800 purring sexily as it ate up the hardtop in a sensuous intertwining of glorious harmonics and warm, perfumed air. After 142 km we turned south for the Bay of Pigs and arrived at the climactic spot where socialism and capitalism squared off in 1961. Cuban families and Canadian package tourists slathered with suntan oil splashed about in the shallows. It was difficult with the sun beating down on a beach as silvery as mountain snow to imagine that blood and bullets had mingled with the sand and the surf here five decades before. 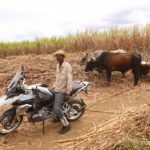 Further east we stopped to get ‘Sugar 101’ from macheteros—sugarcane harvesters—in coarse work clothes and straw hats, slashing at the tall cane with short blunt-nosed machetes. Hard, dirty work. We passed thatched homesteads—bohios—and ox-drawn ploughs tilling the palm-studded land. Then Trinidad came into view. Founded by conquistador Diego Velázques in 1514, this cobbled colonial town—a UNESCO World Heritage Site—has sidestepped the currents of time. We slipped uphill through maze-like cobbled streets that echoed to the clip-clop of hooves. Here, I introduced trip participants to my friends Lazaro Neibla and Leanys Hernández: He an accomplished artist specializing in bas-relief carvings of aged locals, hewn onto colonial-era door panels; she, creator of a women’s lace- and linen-making cooperative. Our route was a magical mystery tour of such fascinating people-to-people encounters: A visit to a rural clinic to learn about Cuba’s community health system… a santería religious ceremony… the tobacco farm of my pal Hiroshi Robaina… and a get-together at the baseball stadium in Cienfuegos with another friend, former national team pitcher Alex Quintero. “The enemy shall not pass our frontier!” screamed a billboard outside Guantánamo. (Others reading “Patriotism or Death!” and “Long live socialism!” left no doubt that we were in a Communist nation. Che Guevara’s visage was everywhere, too, alongside that of Fidel.) Yet everywhere we went, we were feted. It seemed a strange juxtaposition. Rousing anti-imperialist murals offset by three generations of Cubans—most well-nourished, well-shod and clothed, and beaming benignly—sending reassuring waves to us Yanks. 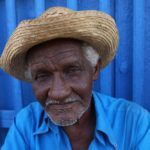 It seemed so innately Cuban: The considerate expression of a people uncommonly gracious and generous to a fault. 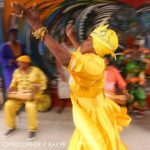 Music is the pulsing undercurrent of Cuban life. Troubadors serenaded us at every meal stop, causing ‘Junior’ (our support van driver) and Enedys (our local guide assigned to us by Cuba’s Havanatur tour agency) to get up and dance a little closer than groin to groin. I was amazed the birth rate isn’t higher. We can learn from the Cuban instinct for gaiety; the fun-loving way they turn adversity on its ear. 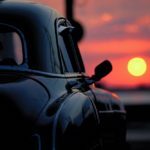 Arriving for a final night in Havana, Luis and I surprised the group by arranging for a ride to dinner at La Guarida—Cuba’s foremost paladar (private restaurant)—in a fleet of ’50s classic convertibles. Then on to the Tropicana, the world-famous cabaret now in its eighth decade of Vegas-style stiletto-heeled paganism. Just 90 miles from the malls and McDonalds of Florida, we’d journeyed to the soul of a haunting realm full of eccentricity, eroticism, and enigma. 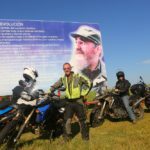 The author leads 8- and 11-day motorcycle tours of Cuba for U.S. citizens on behalf of Austrian-based Edelweiss Bike Travel. www.edelweissbike.com, Tel: (011 +43) 5264-5690), Email: customtours@edelweissbike.com.